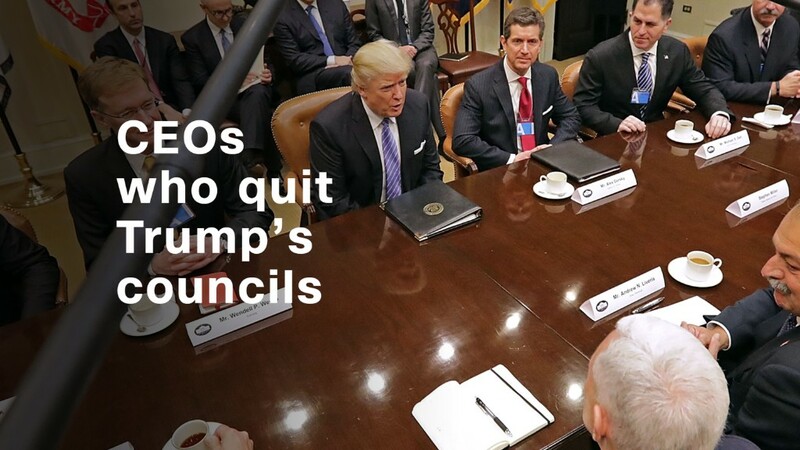 President Trump says CEOs who quit his manufacturing council are "grandstanders" -- and he says he doesn't need them anyway. "For every CEO that drops out of the Manufacturing Council, I have many to take their place," Trump said on Twitter on Tuesday. "Grandstanders should not have gone on. JOBS!" The White House did not immediately answer a request to elaborate. Within minutes of Trump's tweet, a fourth executive dropped out. The group, which Trump established in January with about two dozen members, is supposed to meet occasionally to offer the president advice on job growth. Three CEOs quit on Monday after Trump took two days to denounce white supremacy in the aftermath of deadly violence at a neo-Nazi and white supremacist rally in Virginia. Kenneth Frazier of Merck, Kevin Plank of Under Armour and Brian Krzanich of Intel all left the group. Trump bashed Frazier in a tweet on Monday, saying the CEO would "have more time to LOWER RIPOFF DRUG PRICES!" Several other CEOs issued statements denouncing racism and white supremacy, but said they would stay on the council. Tesla and SpaceX CEO Elon Musk left the group earlier this year after Trump pulled out of the Paris climate agreement.